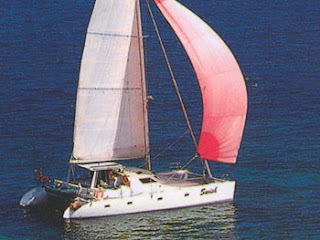 50' luxury catamaran Swish built by Fred Scholtz. 3 ensuite double guest staterooms with queen sized beds, 1 single cabin. Fans in all cabins. Light, airy, spacious salon with comfortable upholstery. Air conditioning. Rigid cockpit bimini with side and rear sun/weather screens. Extensive deck space and large trampolines. Covered cockpit cushions. Icemaker. Dive Platform, transom showers. 36 bottle wine cooler. New sail covers and canvas 2005. Refit of all soft goods in 2007 including all interior upholstery fabrics and carpet. For 2009/ 2010 season, new cockpit cushions, bed linens and guest towels, New galley appliances 2006 including 36 bottle wine cooler in 2007. Sirius Radio 2007.